Spring leagues start thru early March. New teams always welcome. Registration fees include all referee and scorekeeper fees - so there is no out of pocket once you sign up. Individual fees include a team shirt too. 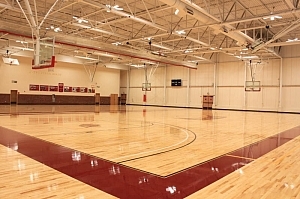 Many of our league games are played at Gates Fieldhouse on the campus of the University of Denver, an awesome location that is very easy to get to from anywhere in the city and has some of the best courts around. We also play games at KIPP Collegiate High School (located south of downtown next to the Alameda Square Shopping Center) and at SWIC located at 1000 S Lowell Blvd and Denver Jewish located 2450 S Wabash st.
We offer men's, women's, and coed leagues with recreational, advanced recreational, intermediate, and competitive skill levels to ensure good competition no matter what level of game you have. Played in highschool, club, or have played consistently in leagues? Then this will be the skill level for you. Advanced Rec is a great skill level for teams and individuals who want to make the jump from Rec ball and play at more of a competetive level. 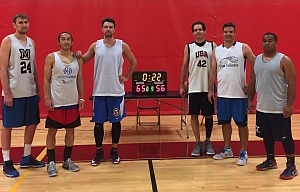 Played in highschool, college, or have played consistently in leagues? Then this will be the skill level for you. The intermediate level is set for those individuals and teams looking to play some competitive basketball. Many teams will run set plays, and all of them will have a great understanding of the game on both ends of the floor. For the players that are ready to take their game to the next level. Think you're up for the challenge? Registration is open for full teams or individuals looking to be placed on a team. Priority registration will save you $$$ so make your move now to secure your spot in one of these popular leagues! Winning teams will recieve customized champ shirts, trophies, $100 off any future registration, or $100 bar tab at one of our sponsored bars.